Glaucoma is a complicated disease which causes damage to the optic nerve and can lead to irreversible vision loss. It is actually a group of diseases which in most cases has no early warning signs or symptoms. Glaucoma can cause blindness if not treated and about 10% of people diagnosed with Glaucoma still experience vision loss with proper treatment. Since there is no cure, early detection through a comprehensive eye exam is essential to prevent vision loss. Everyone is at risk for glaucoma but the risk goes up after the age of 40. Some ethnicities are at a greater risk and family history of glaucoma increases the risk. Also, people with severe nearsightedness are at higher risk, as are Diabetics. It is estimated that 3 million Americans have glaucoma but only half of them know it and about 120,000 people are blind from glaucoma. 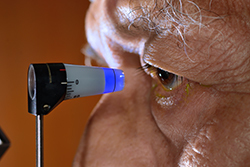 Estimates put the number of suspected cases of glaucoma at over 60 million worldwide. 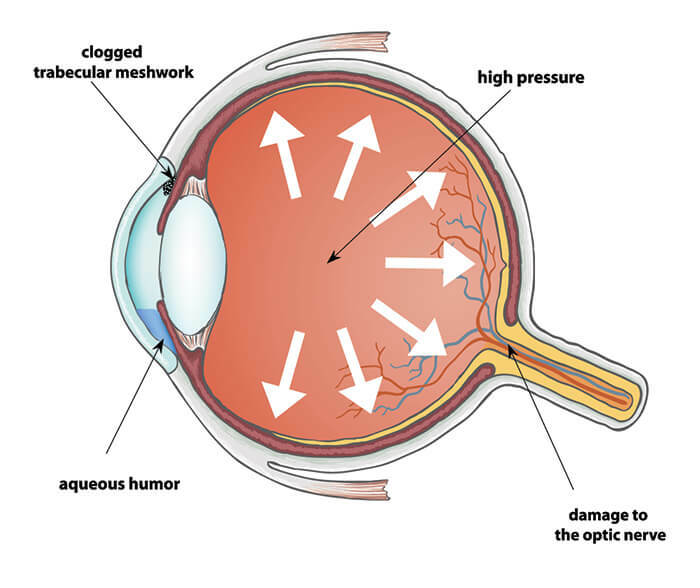 The most common form of glaucoma is open-angle glaucoma, which is about 90% of all cases. It will progress slowly and is marked by a slow to moderate rise in fluid pressure in the eye. Due to its slow, progressive course, there are not any symptoms noticed until enough vision loss has occurred to be suspicious. It is a life-long condition that must be monitored and treated to prevent loss of vision. Other types of glaucoma are angle closure glaucoma which results from the fluid drainage system in the eye being blocked. This results in a rapid rise in pressure and the potential for rapid vision loss. Normal tension glaucoma causes slow, progressive vision loss through optic nerve damage, even though the intra ocular eye pressure is normal. Children can be born with glaucoma due to incomplete development of the fluid drainage canal. There are also secondary glaucomas, traumatic glaucoma, inflammatory glaucoma, pigmentary glaucoma, and glaucoma based syndromes. It is a truly complex disease that requires a complete comprehensive eye exam to detect and properly treat it. There is no cure for glaucoma as yet, but there are ways to treat the disease to prevent vision loss. Recent studies suggest a healthy diet and lifestyle may lower glaucoma risks, but is not effective as treatment. Due to the many forms of glaucoma, there are also many treatment options that are tailored to the disease present. These treatments range from medication drops to various surgeries, all with the goal of lowering the internal fluid pressure of the eye to preserve vision. Since glaucoma can lead to blindness, and symptoms are only noticed after some vision is lost, routine comprehensive eye exams are an important component for good vision quality, and maintaining eye health for a clear visual future.